but I guess free draw of ScreenToGif means more clicks, gifcam UI like a camera is better. Gifcam is awesome and I love it! I wanna suggest a feature though… Could you create a button where I can input the window size I want? I often need to create gifs with an exact size and it’s pretty hard to resize the window to the specific size (the gif is also 8 pixels smaller than the window size if I’m not mistaken, but that’s not a big deal). For some time GifCam worked for me just awesome, it’s the best tool in the world! And then it got broken. PS: I’ve also tried to post this comment under the main gifcam entry twice, but server just dropped my requests. Because your comment has a link, it went to the pending list. I know this sounds dumb but I can’t find the GifCam 4.5 download link. I’ve clicked on everything that looks remotely likely to me but am getting nowhere.Can you clue me in? Hello, can I get link to 4.5 version of GifCam, please? 5.0 Is lagging too much my computer. I have only 2 Gb of ram. With browser open and gifcam recording, its way too much. 4.5 Worked perfectly. Im not saying that 5.0 is bad. Since i have only 2 Gb of ram, I cant use the full potential of the new version, its my fault. Thats why I want to stick with 4.5. I have been using GifCam since the first days of downloadable release but on much more powerful pc than my current one which I no longer have. I would appreciate any link with older version. Thank you! 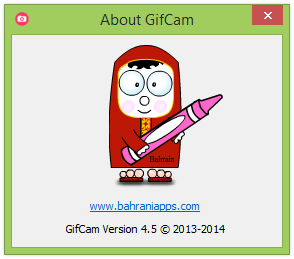 http://www.bahraniapps.com/apps/gifcam/gifcam.php gives the newset version which I dont need atm. But I see no performance decreases or memory leak in 5.0, also GifCam 5.0 has options for customization memory usage and storing temporary frames on hard disk instead of memory.